· Herr Lipp's German exchange visit! · Papa Lazarou's freak show! In a selection of episodes from Series Two of the award-winning black comedy, Reenie and Vinnie are in charge of the charity shop, Tubbs and Edward are looking to fins a 'no-tail' mate for son David, and friendly butcher Hilary Briss is holding a soiree for patrons of his 'special stuff'. In Series Three, Pauline is released from HMP Clitclink and harbours dreams of running her own pen shop, joke peddlar Lance regrets dabbling in the murky world of illegal body parts, and Geoff travels to London to become a stand-up comedian. Note: You may be wondering why we have not included episodes from Series One of the TV series in this collection. 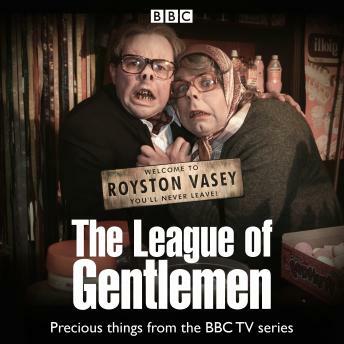 This is because many of the sketches that formed the basis of the first TV series are published in The League of Gentlemen's original BBC Radio series, On the Town with the League of Gentlemen. Although they were reworked a little for television, the Series One audio of these sketches is similar enough to their radio counterparts that we have not included them in this TV series compilation.